What is Nanairo Football Festival? 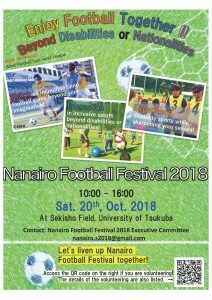 Nanairo Football Festival is a football event that you can exchange, watch, and experience based on the theme of enjoying soccer together with people across barriers such as disability or nationality. The last event was held in 2 Sept 2018, and attracted participants.